From left, Vermont Defender General Matthew Valerio and Vermont Prisoners' Rights Office supervising attorney Seth Lipschutz testify before the Joint Corrections Oversight Committee. Advocates for Vermont inmates housed in private out-of-state prisons told lawmakers today that they have little access to the facilities and limited ability to respond to inmates' concerns and conduct investigations. Defender General Matt Valerio and Prisoners' Rights Office supervising attorney Seth Lipschutz said that they rarely visit prisons in Kentucky and Arizona that are owned by Corrections Corporation of America and house nearly 500 Vermont inmates. Whereas investigators from the Defender General's Office are inside Vermont prisons daily, they visit CCA's prison in Beattyville, Ky., where most of CCA's Vermont inmates are held, two or three times a year, usually in response to assaults or other critical incidents. 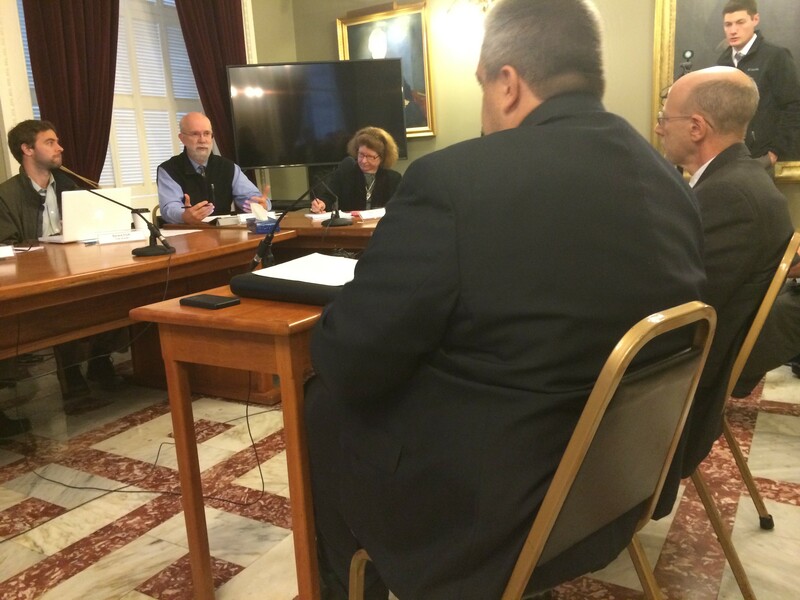 Valerio and Lipschutz were invited to testify at a time when some lawmakers and critics have begun to question Vermont's relationship with CCA and have begun to push the DOC to lower the inmate population and eliminate the need for the out-of-state program. The DOC says it is significantly cheaper to house inmates with CCA than in Vermont. Critics of CCA said the company keeps costs down by skimping on security and programs for inmates. In testimony in Vermont earlier this year, CCA officials told lawmakers that their guards in Kentucky make $8.35 an hour, less than Vermont's minimum wage. "I want to know that between the DOC and the Prisoners' Rights Office ... given the reality that we're sending Vermonters a thousand miles away, that we have enough eyes on the ground to know the staffing ... is sufficient and adequate for the safety of Vermonters shipped out of state," Rep. Bill Lippert (D-Hinesburg) said during a meeting of the Joint Corrections Oversight Committee. "I don’t think that we do," Valerio told him. "There's no chance that we do. There's no way we can do that. We deal with complaints that come to us. We do not have the resources, the people, the time to monitor whether CCA is being compliant with its staffing requirements or anything like that. To me, that's DOC's responsibility." Vermont is in the second and final year of a $34 million contract with CCA to house Vermont prisoners. DOC recently solicited bids for a new contract, which would take effect in July. In an interview after the hearing, DOC Commissioner Andy Pallito said that two private companies have submitted bids. Both would house inmates out of state. Pallito declined to say whether CCA was one of the bidders. Both Valerio and Lipschutz said that they did not believe that assaults and other critical incidents are more frequent in CCA prisons than inside Vermont's prisons. But they said that because of limited staffing, CCA prisons don't offer much treatment or other programs to keep inmates occupied and prepare them for their eventual release.